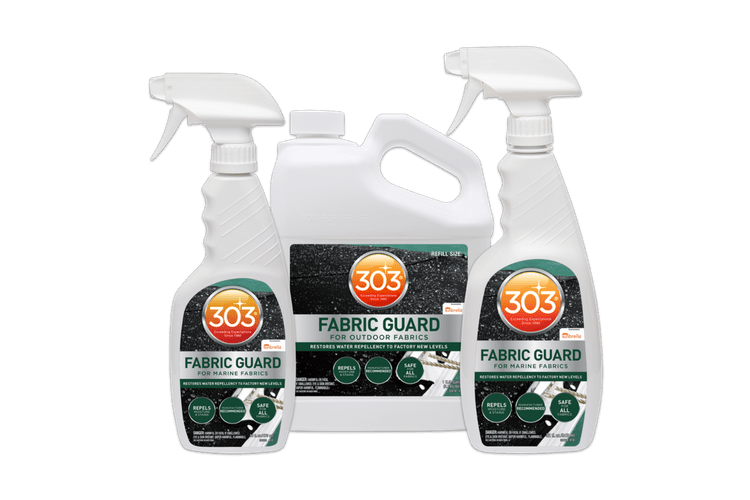 WHAT IS 303® CLEAR VINYL PROTECTIVE CLEANER? 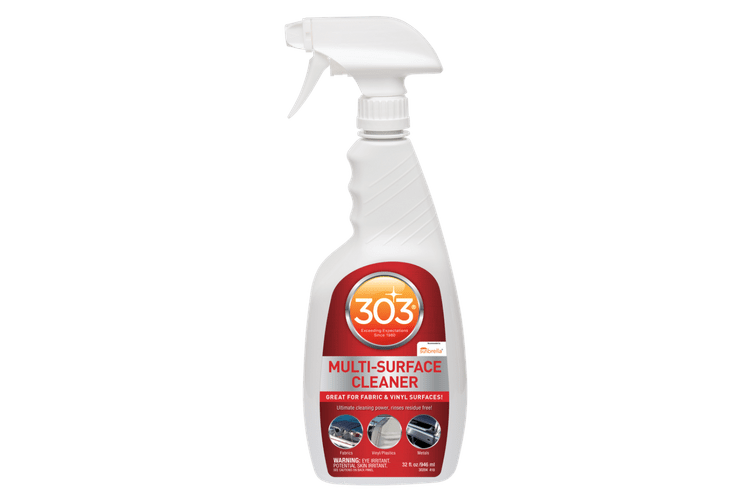 303® Clear Vinyl Protective Cleaner offers superior protection against the harmful effects of UV rays. This product safely cleans and protects against yellowing and cracking of vinyl, clear vinyl, Strataglass™ and Eisenglass, leaving a non-streaking finish. 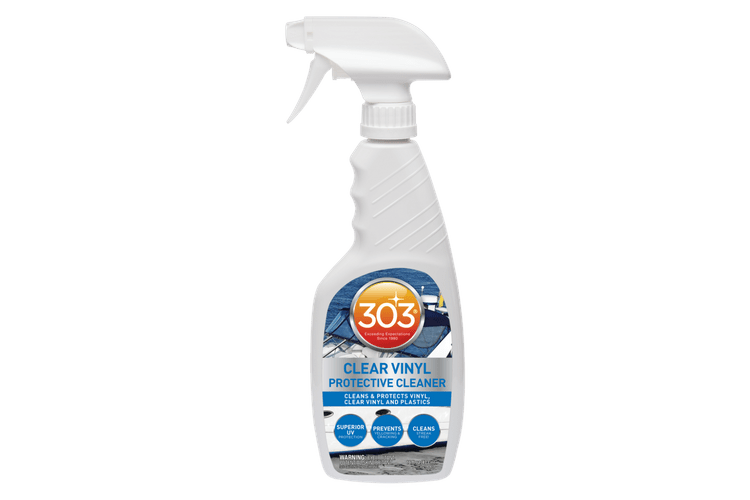 303® Clear Vinyl Protective Cleaner does NOT contain alcohol. 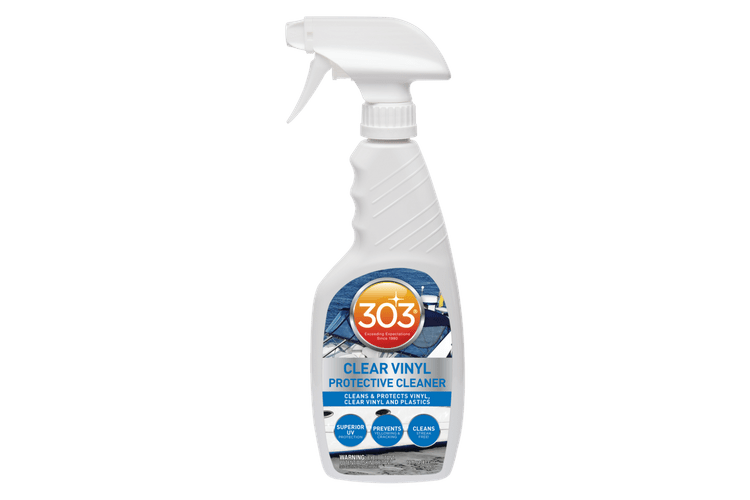 HOW DO I USE/APPLY 303® CLEAR VINYL PROTECTIVE CLEANER? 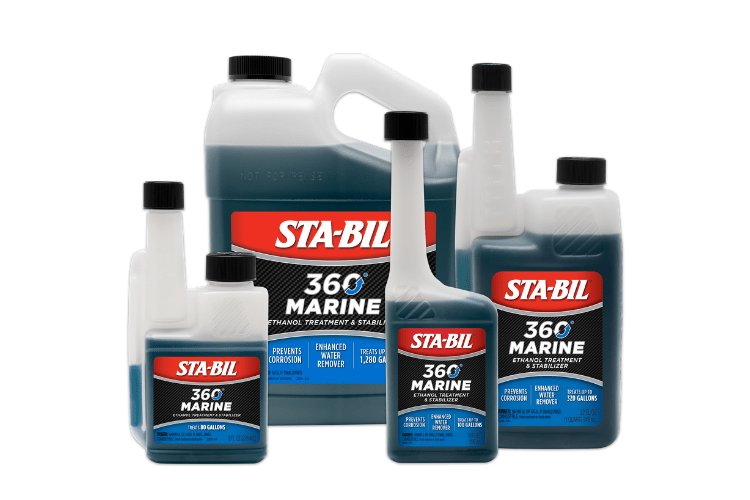 303® Marine Clear Vinyl Protective Cleaner is rated 4.6 out of 5 by 51. Rated 5 out of 5 by METOVT from So Far so Good MY boat is still in storage and I put the canvas up and cleaned both sides of the clear vinyl or isinglass with 303 Clear Vinyl Protective Cleaner. At first, it didn't seem to clear and left a dull finish but I started using one microfiber cloth to apply and a second to polish and that was the difference. It left them brilliant and very clear with sharp detail of objects as you look through the glass. Time will tell if the protective coating aids in preserving them but I will continue to apply as necessary. Rated 4 out of 5 by Hate Work from We will see... This is a tough product to rate, without waiting years.... 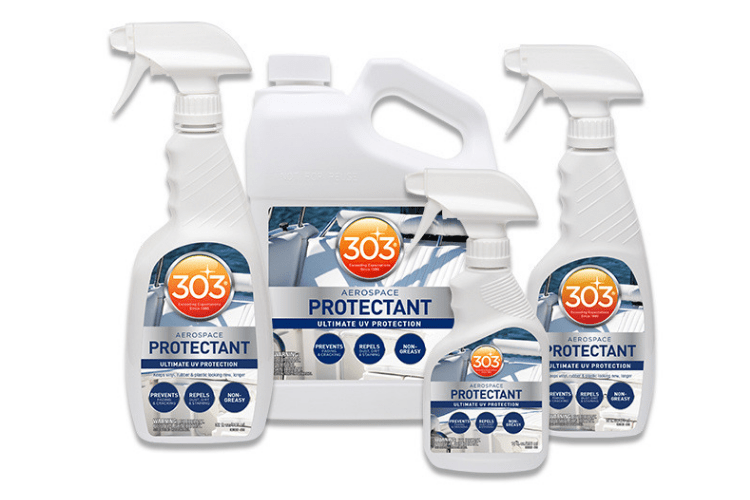 Yes, 303 protectants have a strong reputation, but how do I rate a vinyl "protectant" that I can't see the results of? Product has no alcohol, so that is a good thing. Is dries clear and evenly, so that is another plus. I applied the vinyl protectant to my motorcycle windshield and seats, as well as the dash and vinyl panels of both my cars. Dust seems to be minimal and the shine looks clean. As for the protectant? We will see.... 4 stars for 303 and its reputation... zero for "guessing" on the protectant part. 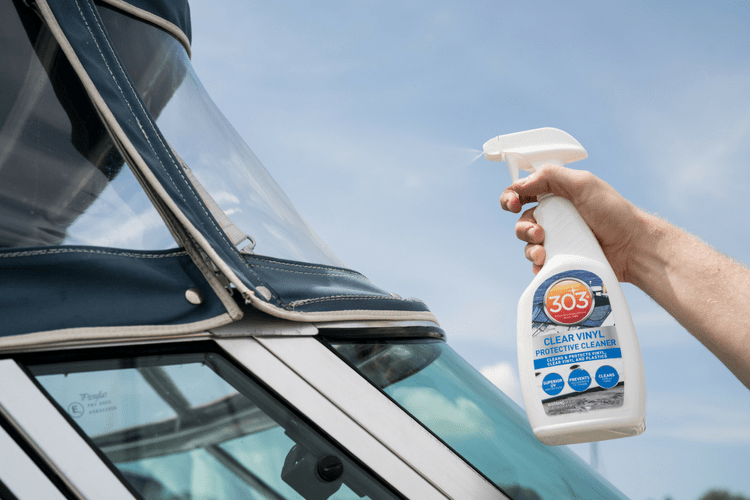 Rated 5 out of 5 by The Fish King from 303 Clear Vinyl Protective Cleaner is "Great" I have used the 303 Vinyl Protective Cleaner on my boat that I use for business " 321 Fish-On Guiding Service ". This product worked exceptionally good and I would recommend it to all my business associates and friends. Thank you 303 for this vinyl cleaner, again it worked fantastic. Rated 5 out of 5 by AAKJR from Excellent cleaner I used this on my 1965 Chevy Malibu SS convertible rear vinyl window. I thought the vinyl window looked pretty good before I started, but after I applied some of the product I noticed how much dirt was on the terry cloth towel. It really cleaned the dirt off of the vinyl. So not only is this a good protective product, it is also a great cleaner. All this in one easy application that buffed off bright and clean. Rated 5 out of 5 by Junkzoo from Brings life back to my plastic windows Used this on some neglected a few years old boat canopy windows, and was very pleased with the results. Removed the slight haze and the bit of yellowing from them and left the window feeling smoother and felt like this product rolled back a few years in making the windows more supple . Quite pleased with the results and they were achieved easily and a lot faster than other products I've tried . Rated 5 out of 5 by Gator from Awesome I am writing for the degreaser. Works great. Cleaned grease off my rims that got slung from bearing buddies. Sprayed and let it set a bit reapplied and scrubbed the grease right off. Awesome product. Rated 5 out of 5 by John P from Goes on clear, easy, and not oily! 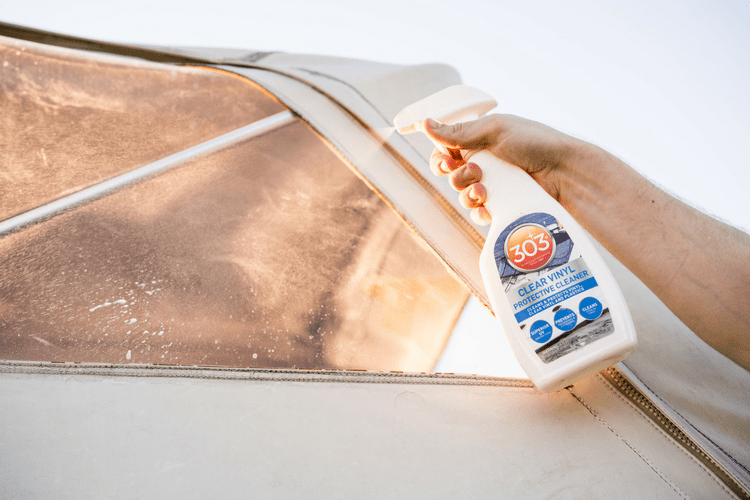 I swear by 303 products for all my Marine needs, I have a 2007 Malibu Wakesetter with brand new vinyls, I rely on 303 and their cleaners and protectants to ensure long, clean, protected interior cushions for all my long days in the hot sun. 303's clear vinyl cleaner and protectant is my primary go to, and as with all their products, it meets and exceeds my expectations!